Necklace measures approximately 18-3/8" inside circumference, allowing the side links measure approximately 1-3/4" long and 1/2" at widest point. The center link measures approximately 1/2" long and 1-1/2" at widest point. Post earrings measure approximately 1-1/8" long and 1/2" at widest point. You will fall in love with this stunning link necklace and earrings set! 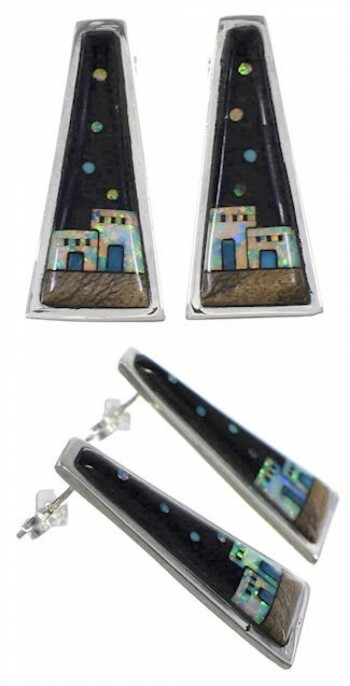 This set is a gorgeous piece of jewelry that is hand crafted out of genuine sterling silver and multicolor inlay. 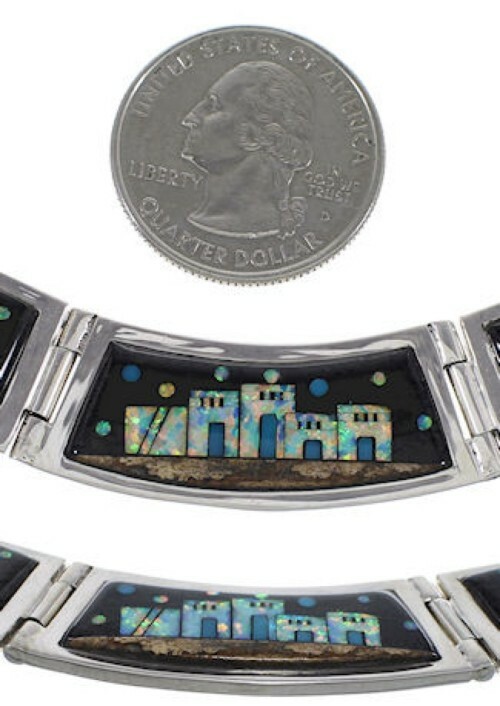 The inlay consists of: real Turquoise, Picture Rock, Black Jade, and man made Opal. The necklace has a total of THREE links, each link features marvelous, detailed inlay work that forms a delightful Native American Village Design. A beautiful starry sky is shown above a village in this amazing scenery. The necklace is stamped sterling and hallmarked. The earrings perfectly match the necklace for a marvelous finish. The earrings are stamped sterling.